A low-flying suicide Zero fighter just about to crash into the armored starboard side of battleship Missouri (BB-63) is one of the most famous American images of Japan's Kamikaze Special Attack Corps. The battleship later became known throughout the world as the place where Japanese military and civilian delegates and high-ranking Allied military officers, led by General Douglas MacArthur, signed the formal document of Japanese surrender on September 2, 1945. After decommissioning in March 1992, Missouri opened to the public in January 1999 as a museum ship in Honolulu next to Ford Island. This large-sized book features numerous photographs, many in color, of battleship Missouri and related subjects. However, the book does not focus on in-depth historical details specifically related to Missouri and often digresses into background details and related topics that have little direct relationship to the famous battleship. Kit and Carolyn Bonner have authored or coauthored several other books on naval history including Cold War at Sea (2000) and USS Iowa at War (2007). USS Missouri is one of four Iowa-class battleships, the last US battleships to be built, so much of the authors' research for the similar book on USS Iowa would also be relevant to this one. A few photographs included in the book come from ones taken by the authors. Kit Bonner has a personal connection with Missouri, since the office of his father, personnel officer for the Pacific Reserve Fleet, was for a time aboard Missouri while docked as part of the Reserve Fleet in Bremerton, Washington. Kit had the opportunity to explore the battleship's compartments while moored. 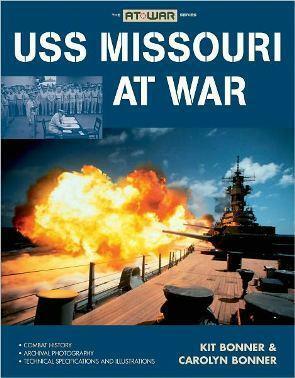 Despite this personal link, the book completely lacks personal stories from veterans who served aboard Missouri. As a result, the main narrative, which takes up somewhat less than half of the book's pages with the rest devoted to photos, does not capture the spirit of the warship's crew. After extensive background information on battleships and a brief overview of Missouri's history in Chapters 1 and 2, the next five chapters cover Missouri's history in roughly chronological order although in a somewhat disjointed manner as the narrative switches back and forth in time. These chapters cover the wars and conflicts in which Missouri fought including World War II, Cold War, Korean War, and First Gulf War. Missouri was decommissioned and mothballed as part of the Reserve Fleet in February 1955 and was modernized and recommissioned in May 1986 as part of US actions to counter the Soviet military threat. The background information presented in many chapters runs much too long for a book entitled USS Missouri at War. For example, the chapter on "A Growing Soviet Threat" includes 15 pages on the history of the Soviet Union's Navy before the discussion begins of the US Navy's countermeasures including the modernization of Missouri and other Iowa-class battleships. 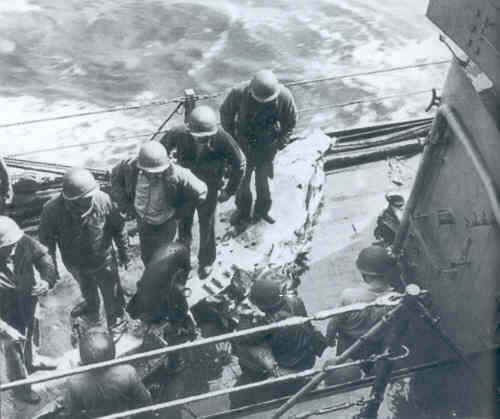 Chapter 3 on Missouri's service during World War II includes a couple of paragraphs on the two kamikaze attacks that took place on April 11 and 16, 1945, during the Battle of Okinawa. Four photographs of the Zero fighter kamikaze attack on April 11 show the famous image of the approaching Zero, a machine gun from the Zero impaled on one of the barrels of a 40mm quad gun, the right wing that landed on deck (see photo at bottom), and black smoke drifting behind Missouri after the crash. The description of this first kamikaze attack lacks details such as how the plane approached, number of casualties (only one wounded), and identity of the pilot who was given a ceremony the following day to bury him at sea. Another Zero fighter tried to hit Missouri on April 16 but crashed just off the ship's stern. The violent explosion showered the fantail with shrapnel and debris, which wounded two crewmen. The book's best story relates to the incident in which Missouri ran aground on Thimble Shoals in Chesapeake Bay after leaving Norfolk Navy Yard on January 17, 1950. It took 17 days before the huge battleship could be pulled loose, and Captain Brown was found guilty of negligence, relieved of command of Missouri, and suffered the loss of 250 places on the list of captains awaiting ships. Few other detailed stories such as the grounding incident can be found in USS Missouri at War, which focuses more on background information than the history of the battleship and her crew.